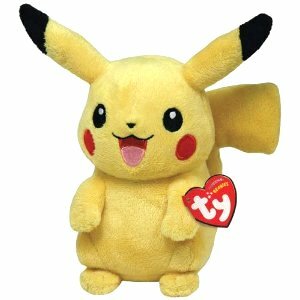 Pikachu is made from a bright yellow fabric with embroidered black eyes, black nose, red cheeks and dark red and pink mouth detail. The tips of his long ears are black, the base of his tail is dark brown and there are two dark brown stripes on his back. Pikachu was introduced along with five other Pokemon characters in October 2011.